Fishing for a range of species offers the angler choice. It keeps things interesting and gives you more scope to set yourself a variety of challenges. Also, climate can often have a significant effect on your fishing, so being able to match the species to the conditions can provide you with some excellent sport. The pike, along with its other predatory counterparts – the perch and zander, can deliver some great fishing memories, even on the coldest days in winter. Fishing for pike can be quite varied. You have the choice of ledgering, float fishing, lure fishing or even fly fishing. You can fish for them from the shore or from a boat and you can catch them in both lakes and rivers. This article covers what you’ll actually need to get started when fishing for pike. The tackle and techniques can get quite complicated, but this article aims to provide you with some sound, general information on the what you should consider before you start out on your new adventure with the pike. Knowing how to handle pike is extremely important and something you must research before setting out to target them. They can grow very large, are full of teeth so handling them appropriately is crucial. As with all fishing, fish care must come before anything else. Although the pike looks fierce, it’s actually a delicate fish. Across the internet there are hundreds of resources that will show you exactly how to handle a pike correctly. In my opinion, you should always go with an experienced pike angler on your first few sessions. Watching how they handle the pike and maybe having a go under their instruction is a far more effective way of learning compared to reading online or from a book. It’s vital for both yourself and the fish that you are able to handle pike confidently on the bank. Take it steady when handling pike. If in doubt go with someone that has a bit more experience than yourself. Fishing for pike in spring and summer continues to be a controversial topic. Many anglers believe that pike is not a species that copes well being caught in the summer. In addition, bright and sunny conditions don’t lend themselves to being great for pike fishing anyway. In my experience, a slightly mild winter’s day which is overcast make for the best conditions, with dawn or dust being absolutely optimal times, as the light levels are low. I’m a passionate lure fisherman and I think it’s the perfect place to start when fishing for pike. You can get up and running quickly as you only need a small amount of gear. Specifically, really all you need is a rod, net, some wire traces and a pocketful of lures (and of course all the necessary items that I have listed above to deal with the fish once it’s in the net). It really is the simplest, most straight forward way of fishing for pike and perch. You travel light, keep active when it’s particularly chilly, you get to explore and find the fish. Obviously, as you progress, you will probably want to buy a dedicated lure rod and reel but initially just take what you’ve already got from your other fishing adventures to get out there and give it a try. This does assume that you’ve done other types of fishing. If you are totally new to fishing, then I would not recommend that you start your fishing adventures by targeting pike. Catching a range of smaller fish that are easier to handle feels like a much more sensible place to start. There are two main methods when it comes to fishing with deadbaits, ledgering and float fishing. When fishing on the deck, a fairly standard carp set up will do the job. 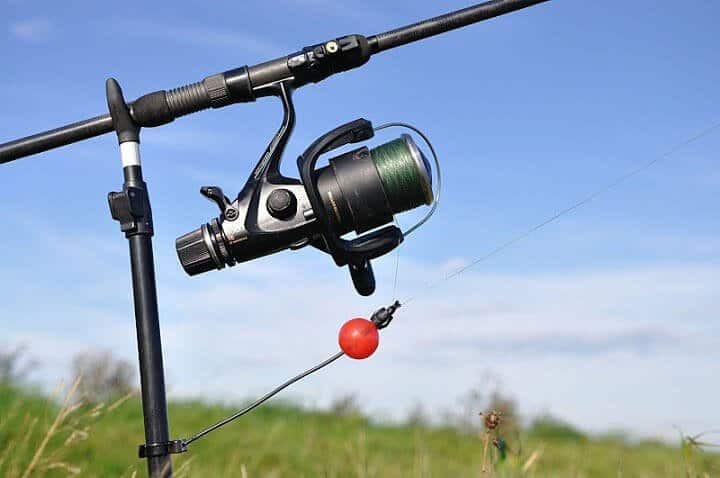 By that what I mean is having a couple of rods and reels set up with reasonably strong line on, with bite alarms installed as if you were fishing for carp. The only main difference is the bite indication. You need some light indication that offers a very low amount of resistance. If a pike feels any resistance when it picks up the bait, then you are likely to get aborted takes. See below a drop-off style bite indicator, used when ledgering for pike. These are fixed to your rear bankstick and provide resistance free indication. End tackle is often a simple running rig. Again, this offers a minimum amount of resistance from the lead when the fish picks up the bait. I use running rings that feature a large eye and therefore offer very little resistance. I typically attach a 2-3oz lead, depending on how far out I am fishing, and of course, you would require a wire trace that has two sets of trebles. I would highly recommend that you use treble hooks, where only one of the hooks has a barb and the other two remaining hooks are barbless. The barbed hook is put into the dead bait to ensure it holds firm, whilst the barbless hooks are exposed for actually hooking the pike. This will go a long way to help you unhook the pike in a safe and timely manner. See diagram below of a typical dead bait rig that would be used for ledgering for pike. In all types of fishing, it’s hard to beat that moment where the float slips away. You stare for ages at a static float, which all of a sudden springs to life. It also means that you get very early bite indication, helping to avoid any deep hooking that makes things more difficult than they need to be once the fish is on the bank. When float fishing for pike, the first thing to feed onto your main line is a bead, then a pike float (I prefer the in-line float), then ball weight, then another bead and then finally I would tie on the wire trace. Lastly, tie some power gum above the very first bead as this will enable you to adjust the depth at which you want to fish. My advice would be to let your float drift around the swim try a range of depths by adjusting the power gum. See below a diagram of a typical float set up. With the equipment and tools listed above, you’re pretty much good to go and start your pike fishing campaign. With that said, there are a few things that will make it more comfortable and enjoyable, so don’t forget these items too! However you choose to fish for this fantastic creature; I hope you enjoy doing so. The pike is really quite a magnificent fish which can provide great sport throughout the colder months. Their markings through winter are arguably more impressive than any other coarse fish. If you are the type of angler that hangs your rods up in winter, it’s time to think again. Trust me, when a big predator strikes it will take your breath away. Choose your method and approach from the information provided and you will never look back. Like many, I started my angling life as a kid fishing for roach and perch on small lakes and rivers. By the time I was an early teenager I was catching carp, something I’ve always done and still enjoy today. My pike fishing goes way back over 30years. Fishing a range of venues including local club lakes and progressing onto some of the reservoirs. Over the last decade, my fascination with predator fishing has grown. I was lucky enough to own a boat on the River Ouse for several years and I spent many happy days lure fishing up and down the river catching some fantastic pike along the way. In more recent years I’ve sold the boat and have hit the river banks and large lakes around the Lea Valley in a hunt for pike and large perch, which has also become somewhat of an obsession! Fishing for Pike: Why Use Lures?